grip, stance, attitude, waggle, swing cadence, swing plane, follow through and on and on . . .
GOLFSTR is designed to remind you to keep your leading arm straight in the your back swing. Most golfers are aware of this but the majority of us somehow can’t keep this in our brain. We need help to rewire our brains and that is exactly what GOLFSTR is intended to do. Wear GOLFSTR while you playing 18 holes and seeing the change. Video introduction to GOLFSTR describing how to use it. 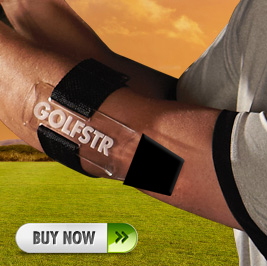 GOLFSTR straps on your leading arm (left arm for right handed golfers) just below the crease in the elbow. When you straighten your arm the end of the GOLFSTR presses on the back of your arm. If you bend your arm in the back-swing you feel it lift off your arm. Instantly you understand the limit of your back-swing. Eliminating or limiting the bend will help you hit balls more consistently. By playing a round of golf with the GOLFSTR, you can see your success. By making more consistent shots, you will learn to grove that new swing. Relax your arm muscles, use a medium grip pressure and straighten your leading arm so that you feel the GOLFSTR touch the back of your arm. In the takeaway with your leading arm straight, hold your trailing elbow in to your side to allow the club face to open up as you hinge your wrists up. Continue to rotate only to the point where your arm can remain fairly straight. It’s that magic moment when the end of the GOLFSTR starts to lift off the back of your arm. That point is the limit of your back swing. Complete your swing with a smooth transition, weight shift and follow-through. Want-to-be golfers (and I was one of them) make an excessive back swing by bending the leading elbow. This is not helping the swing as it only causes you to swing the head of your club too high (over the top) and down on too steep of a plane. This results in a slice across the face of the ball or over the top of the ball . The key for success is knowing when your leading arm is at the point of bending and limiting your back-swing at that point. And even better you can play 18 holes of golf and watch your score improve with more consistent hits. Golfers with a handicap of 15 to 50 need to learn the correct swing. Swinging a golf club is NOT like swinging a baseball bat with a bent leading arm.